The Gallagher Chiefs are back in action at home this Saturday, after coming off an impressive 27-22 win against the Highlanders last Friday. Even though the home team have four consecutive wins under their belt, they are not underestimating their northern rivals, the Blues, in what promises to be a true Battle of the Bombays this Saturday at FMG Stadium Waikato. Head Coach Colin Cooper sees this as a very important match. Cooper has made three changes to the starting fifteen from the hard fought victory over the Highlanders last weekend. 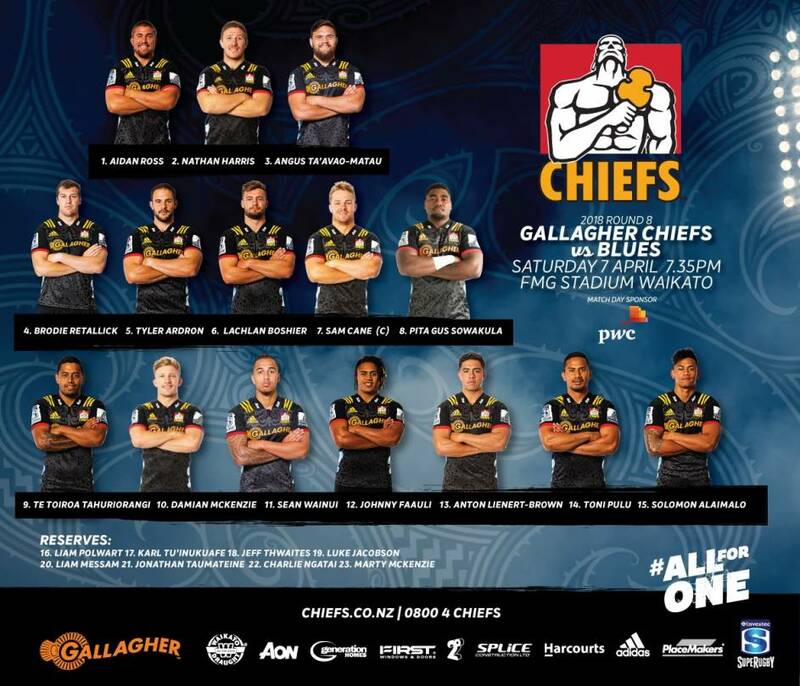 The tight five is again unchanged, Lachlan Boshier coming back into the number 6 jersey, co-Captain and now centurion Sam Cane staying put in the number 7 jersey, and Pita Gus Sowakula crashing his way into the starting lineup after a strong debut off the bench last week. In the backline Te Toiroa Tahuriorangi gets a start at halfback, with Jonathan Taumateine backing him up in the number 21 jersey. Cooper wants his players to be focussed and to become more consistent within each game. The last time the teams met was in a gruelling derby at Eden Park in Round Three. The Gallagher Chiefs battled to a 27-21 victory which went right down to the wire. This upcoming clash will be just as tough. Kickoff for this crucial New Zealand derby is at 7.35pm on Saturday night at FMG Stadium Waikato.